SHAME on members of the Elk Grove City Council Our community cannot move forward from the violence and hatred recently on display in Charlottesville, Va without talking about the effect it has had in our area, and the shameful lack of spine demonstrated by our own Elk Grove City Council members at the Aug. 23, 2017 meeting when they dragged their heels publicly condemning violence. The city council meeting was more than a week after the Aug. 12 violent and hate-filled demonstration by anti-Semitic, bigoted Neo-Nazis and members of the Ku Klux Klan who openly and publicly marched, carried Tiki Torches, and chanted hate speech as they protested the removal of a statue of Confederate general Robert E. Lee from a public area. Alerted to the march, Charlottesville clergy organized a peaceful service of clergy members and leaders from all over the country and many religions including Sacramento’s own Dr. Cornell West to counter the hateful words of the Nazis and Klan members. Peaceful clergy members were at first trapped in a church after hate-spewing protesters surrounded the building. Good citizens from all over gathered to support the clergy by marching with them against the hate groups. One of the Neo-Nazis drove a car into the peaceful protesters, killing 32- year-old Heather Heyer and injuring five others. Shame on Elk Grove’s City Council members who dragged their feet going on record in a unified statement calling out the hate groups that gathered in Charlottesville, Va. What should have been a quick and decisive statement by our council members opposing hate turned into an unnecessarily laborious and time consuming and empty response. Shame on the council members who did not once acknowledge the death of Heather Heyer, who like many other freedom fighters gave her life so all in our democracy can be free and treated equally. Shame on Darren Suen for parroting Steve’s Detrick’s spineless recommendation to “mind…our own business and focus on the 170,000 in Elk Grove,” saying he wouldn’t challenge another elected official’s statement, no matter how cowardly. Sometimes staying out of people’s business is a good thing. Sometimes it’s not. Minding our own business is why six million souls were viciously eradicated under the Third Reich. Some elected and un-elected leaders are fearless and have the courage to stand up and make it their business to speak out against hatred and injustice – and then there are others who don’t. In cases like this, you either stand up or you are complicit – there is no grey area. 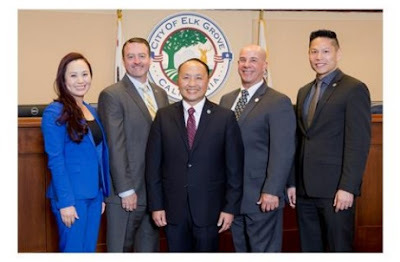 Shame on Steve Detrick and others who routinely bring up Elk Grove’s MultiCultural Festival as a hallmark of how much the city is committed to equity and diversity. It is absolutely not enough. Shame on council members Steve Ly and Suen who did not have the guts to support Councilmember Stephanie Nguyen’s proposal to begin a discussion and dialogue about why the Confederate flag does not have a place in the school district. If Kente cloth – an expression of achievement usually worn by African American students in high school and college – cannot be worn at the Elk Grove High School graduation due to district policy and an African American academic scholar wearing such a cloth was escorted off the stage by law enforcement officers, why can’t we have a conversation about the history and symbolism the Confederate flag represents? For most citizens that rebel flag has served no other purpose but to intimate people of color. The biggest piece of “shame pie” is saved for Councilmember Patrick Hume, who repeated the falsehood hinted at by President Trump when Hume said at the council meeting, "Part of the reason the situation escalated to the level that it did was because they tried to match hate with hate. Those people with abhorrent ideology had marched in that town for three weekends prior and without incident, and it wasn't until they were confronted rather than dismissed or mocked that things escalated to that level." The counter-protestors in Charlottesville weren’t violent. Hume’s comments make it crystal clear that he subscribes to bigotry, racism and domestic terrorism. He owes the people in the community an apology and explanation. Elk Grove, we can do better. And we must. It is time we had a real discussion. Signed: South County African American Coalition. Kudos to the South County African American Coalition for speaking the truth. And finally, a group of people who had the courage to call out Elk Grove City Councilmember Patrick Hume for his continued opinionated, biased sermons using the dias as his pulpit knowing full well that the other council members are his disciples who continuingly display blind allegiance to him. So yes, shame on the Elk Grove City Council! The simple explanation is that the development lobby, err, the "stakeholders", would prefer that their councilmembers stick to the script before them. You get them off-script and who knows what would happen to the investment climate of Elk Grove. With ballooning warchests and no elections by district (yet), it's pretty hard to unseat these characters. So while the truth may set you and me free, the truth will not separate the butts of these characters from their big leather chairs anytime soon. Sorry, that's the sad truth.